All the schools in a small Canadian province have been evacuated due to a bomb threat that police now believe may have been a hoax. More than 19,000 students were cleared out of 60 schools on Prince Edward Island after a threat was sent by fax. Officers searched the schools, but no device was found. Universities in Nova Scotia were also evacuated. One suspicious package found near a library in Halifax, Nova Scotia, turned out to be rubbish. The remote Prince Edward Island is Canada's smallest province, with a population of 146,000. Speaking in Ontario, Prime Minister Justin Trudeau said that "all children are safe". "As a parent I know how worrisome this type of situation can be," Mr Trudeau said after receiving an update from the minister of public security. Police in Ottawa received an anonymous fax warning that a bomb would be detonated and threatening unspecified schools. 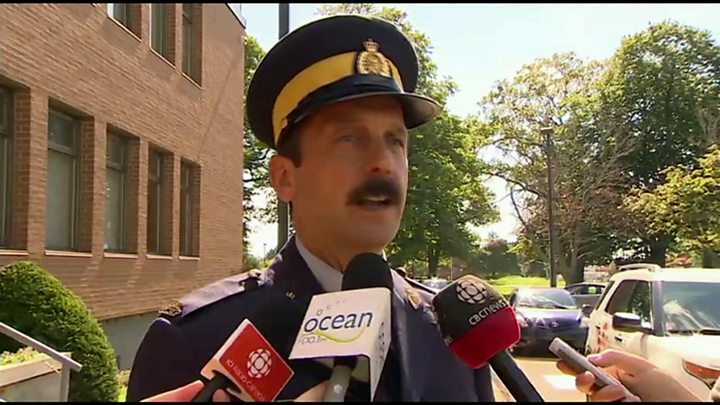 Sgt Kevin Bailey from the Royal Canadian Mounted Police told reporters: "To my knowledge there's been no injuries, there's been no threat found. "I would feel safe for my child to go back to school. If nothing suspicious is found I'll be satisfied that the threat is a hoax." Students were taken to safe locations where their parents could collect them later, the Royal Canadian Mounted Police said in a statement. Schools will open as normal on Thursday on the normally sleepy island, which is famous as the setting for LM Montgomery's classic 1908 novel Anne Of Green Gables. Cape Breton University was also evacuated due to an unspecified threat, the Canadian Broadcasting Corporation reported. Schools in Winnipeg also received a faxed threat but the city's police service said they believed the threat was "unfounded". "It appears the threats were very similar in nature," said Winnipeg Police Services PC Rob Carver, though it's unclear the events are linked. Last year, 640,000 students were kept away from school after a threat was sent in by email. In New York City, officials received a similar threat but said it was so "outlandish" they ignored it. Winnipeg School Division spokeswoman Radean Carter said all schools were contacted and staff were told to be vigilant, though the schools remained open. The city's police service later said they believed the threat was "unfounded" but are continuing to investigate the threat in collaboration with other police services. In May this year, students at seven primary schools in Northern Ireland, five schools in England, two schools in Wales and multiple schools in Scotland were disrupted when hoax bomb alerts were phoned in to their schools. A teenage boy was later arrested in connection with the threats made in Scotland.